Sean McNown has been a Kansas City native all his life. He attributes all of his musical talents to his family. And he studied piano from his grandmother Edythe (well known in KC for her piano playing and teaching). He watched his father Greg star in countless operas and his mother Gaye perform in various successful cover bands. Sean has been involved in music all of his life, but became more serious shortly after high school. 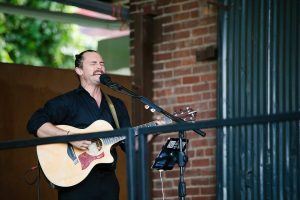 After graduating from Shawnee Mission East in 2000, Sean attended the Conservatory of Music at UMKC majoring in Music Education but quickly switched gears to pursue live entertainment in 2003. Performing solo (using loop, harmonizer, and other various effect pedals), duo, trio, full four-piece shows, DJing and even sound for corporate events; playing a mix of songs from the 60’s through today as well as a hand full of original material. Sean has played at bars, restaurants, clubs, country clubs, private parties, fairs, weddings and wakes, but is ALWAYS looking for new venues! Contact Sean for pricing and availability, or join the email list to stay up to date with all upcoming news and shows.